Bigger blocks rock, y'all. I have always loved the Road to Tennessee pattern, but I've shied away from making one because traditionally the blocks are pretty small, and sometimes I'm just a little bit lazy. It's okay. I admit it. 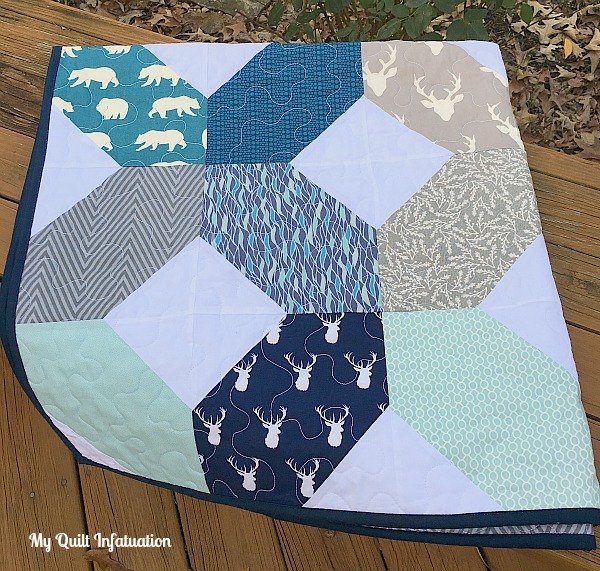 When I got the woodland themed fabrics for this baby quilt though, and saw that the animal prints were fairly large, I figured they would work well to size up the traditional RTT block. I love how it turned out, and how quickly it went together! I used just nine different fabrics, with four 8.5" squares cut from each one. The white corner squares were cut 4.5." The blocks finish at 8 inches, making the entire quilt 48" square. I think this is a great use of bigger prints, or even a small bundle of fabric that may be difficult to mix with others. When I took this photo, I intended to just give a close up of the stippling and a few of the prints, and I only realized later that this pic actually shows all nine fabrics. I think they all play so well together, considering that they are mixed from my stash, and not from a single collection. The backing is pieced with wide stripes, using up most of my leftovers, and that darkest navy blue just begged to be used in the binding. 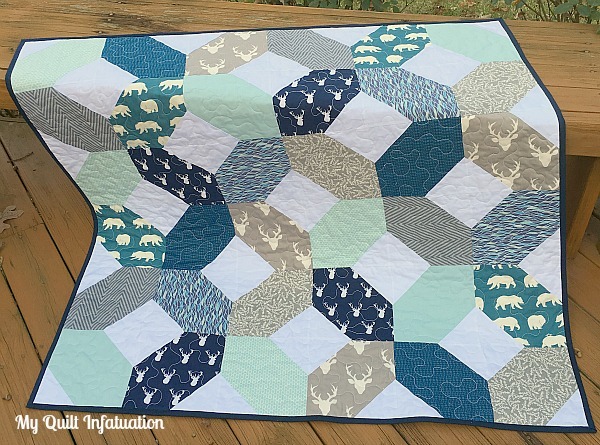 The slate blues and smoky grays in this quilt, along with the woodland animal prints, inspired the name, Smoky Mountain Hike, and it is going to look amazing as the focal point in the nursery. With Thanksgiving approaching at breakneck speed, I am so glad I was able to check this one off my list! This would be great for a baby boy quilt that I need to make in a hurry! Thank you for the inspiration! Love the beautiful simplicity and the lovely fabrics! Congrats on a great finish! Lovely colours. Isn't it good when you can find complimentary fabrics from stash? I made a baby boy quilt last year and another earlier this year by choosing fabrics I already had - similar colours to yours. Your RTT pattern works well, shows up the individual fabrics beautifully. Yes, this is definitely a case where bigger is better! Congrats on another finish! Are you decorating a nursery??? Looks great! I'm working on one that I'm starting with 10" squares. This is a perfect pattern for larger print fabrics. I sometimes find it difficult to pick a pattern that works well for a baby boy quilt. This one definitely fits the bill. Beautiful finish. This is great. I don't believe I've seen this pattern before. Thanks for sharing the upsized dimensions. I'm with you on big blocks. Besides, they show off the large scale prints we both seem to like so nicely. BTW, where did you get the label I see on the back? Really nice quilt ! I like very much this simple and modern style. And the colour scheme too. Thank you for sharing. I really love the colors! Perfect for this RTT block...smoky mountains! Beautiful quilt indeed and big blocks do rock! 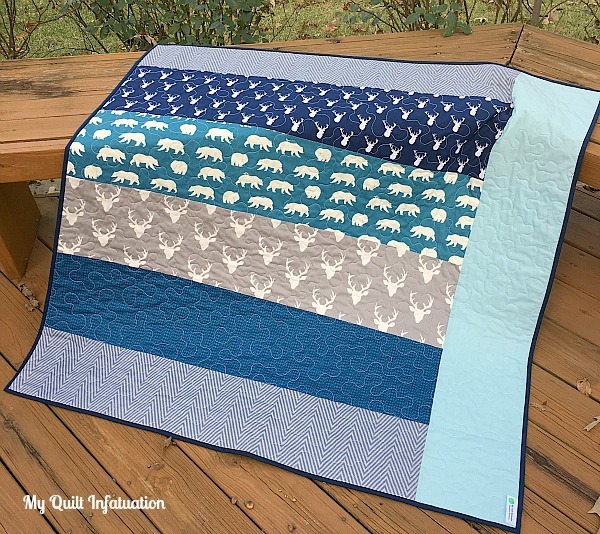 great quilt....definitely going on my list of quilts to make....I honestly thought the fabrics were from a collection line.....great picks from your stash! A very fun baby quilt. The name is just right and so are the fabrics. Congrats on another beautiful finish. 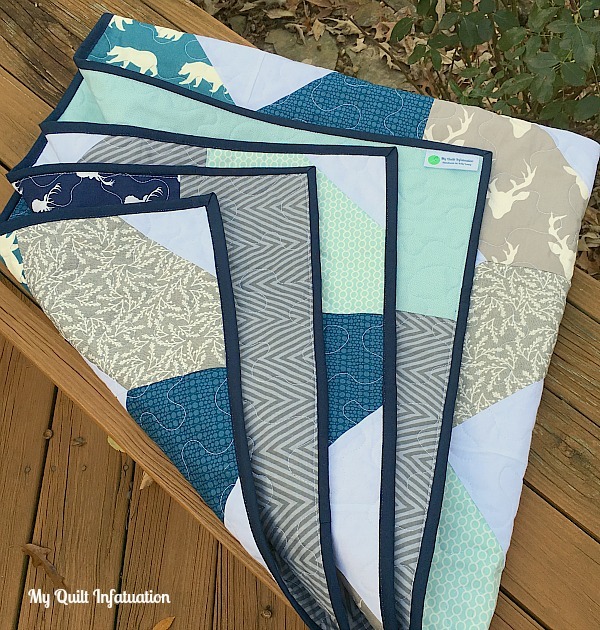 What a precious little quilt Kelly and what neat prints!